Nitrogen gas is non-reactive colorless, odorless, and tasteless. It is present in all living organisms and is abundantly found in the atmosphere and can join up with other elements without causing problems. These qualities are just some of the reasons why it is incredibly useful across a range of applications and industries. There is hardly an industry that doesn’t use nitrogen gas. Farmers and farming manufacturers rely on nitrogen gas to help preserve food after the harvest with cryogenic cooling, but that’s not all. Nitrogen can be used for thermal spraying and surface heat treatment. Chemical Processing. The use of nitrogen during chemical processing can help reduce emissions, improve safety and capacity, or cut costs. Specific applications include: deflashing, inerting, process cooling, stripping, and solvent recovery. Metals processing and heavy equipment manufacturing are made more efficient and products can be made better with nitrogen gas. Electronics, Packaging, Assembly and Test. Nitrogen is used in a wide variety of electronics products from CPUs and capacitors to circuit boards and semiconductors. Finally, you’ll find manufacturers using the gas in packaging to keep components safe from contamination during transport. Nearly every industry in the energy sector has found uses for nitrogen gas. Bioenergy, Natural Gas, Petroleum…they all use the gas for processes like inerting and blanketing, liquification, gas displacement and separation, and pressure testing. Food & Beverage. The most widely known use of nitrogen in the food industry has to do with food preservation, but it can also be used to cool or freeze foods, as a bleaching agent, for temperature control, beverage dispensing, and inerting. Glass & Mineral. Nitrogen is used in packaging and atmospheric control, chilling concrete, suppressing combustion, melting and refining, forming, assembly, and recycling. Leisure & Recreation. Scuba gear, paintball guns, balloons may all use nitrogen gas as an alternative to other gases. Medical applications abound from Cryopreservation and Cryotherapy to X-rays and MRI magnet cooling, and nitrous oxide gas. Metal production and processing both benefit from nitrogen gas. The gas has been used in foundries, mills, thermal spray coatings, and cryo-treatment. Pharmaceuticals & Biotechnology. Nitrogen’s non-reactivity is particularly valuable in biotech and pharmaceuticals. The gas is used in cryopreservation, for inerting, in low-temperature situations/reactions, for Lyophilization/cooling, particle size reductions, solvent recovery, and stripping. Rubber & Plastics. Heat-sensitive plastics manufacturing has found the cooling effects of nitrogen to be invaluable. The gas is used in the manufacture of tires and rubber products, in blow and injection molding as well as plastics and rubber recycling. The aerospace and automotive industries rely on nitrogen during metals processing for inerting, shrink-fitting, and thermal spraying. The gas is even used in aircraft fuel systems to combat fire hazards and in rocket fuel. For as useful and commonplace as nitrogen is, it’s not without its dangers. In its purest form, nitrogen can be dangerous by displacing oxygen. That’s why proper ventilation is so important when using the gas. Always use the nitrogen gas you receive for its intended use and use it as directed. 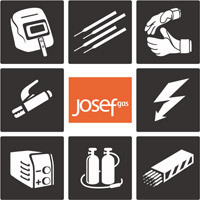 If you find yourself with another need for nitrogen, contact Josef Gas first. We can help you find the right gas mixture and dispensing mechanism to safely meet your needs. Contact Josef Gas at 416-658-1212 or email us at info@josefgases.com to discuss your nitrogen gas needs in detail.